Xiaomi just launched its latest smartphone dubbed "phablet" in India, the Mi Max 2. The successor to the last year's product and the subsequent Prime variant that the Chinese company, the Mi Max 2 represents the best of Xiaomi. The Mi Max sold over 3 million units which solidifies the user base even more for people who love a large smartphone. And then the Max 2 builds upon that. Backup data is more and more important these days. We are gonna tell you the method of how to backup and restore your Xiaomi Mi Max 2 in a convenient way. 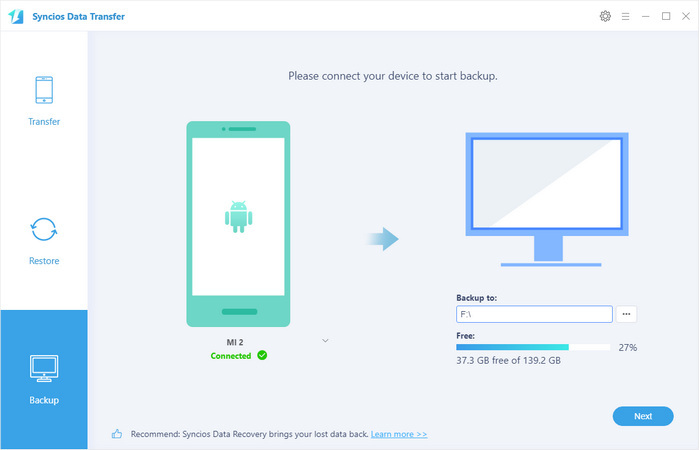 To prepare for backup or restore your Xiaomi Mi Max 2, you need to download and install Syncios Manager and your computer. After installed successfully, launch it and connect your Xiaomi Mi Max 2 through USB cable. You will see five main categories show on the left side once your phone connect successfully. Choose the category you want to backup for. Syncios supports to backup both file and folder. If you want to backup the whole folder, just select the certain folder and click 'Export'. 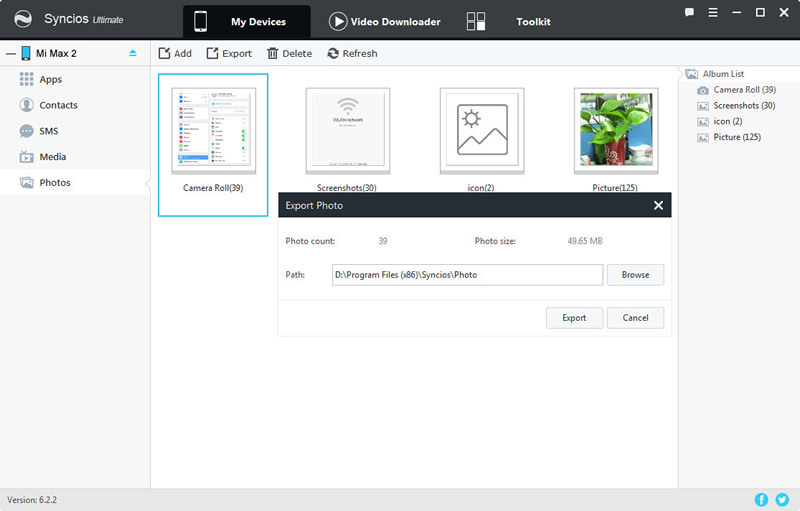 For them who want to backup the certain item can double click the folder to select multiple contents of your willing, then click 'Export' to backup. Choose the category you want to restore. Click 'Add' button which locates in the menu bar. You can import files or folder of your willing, select the content and click 'OK' to start transfer. Launch Syncios Data Transfer and select 'Backup' at the first interface. Connect your Xiaomi Mi Max 2 to computer via USB cable or using Wi-Fi. 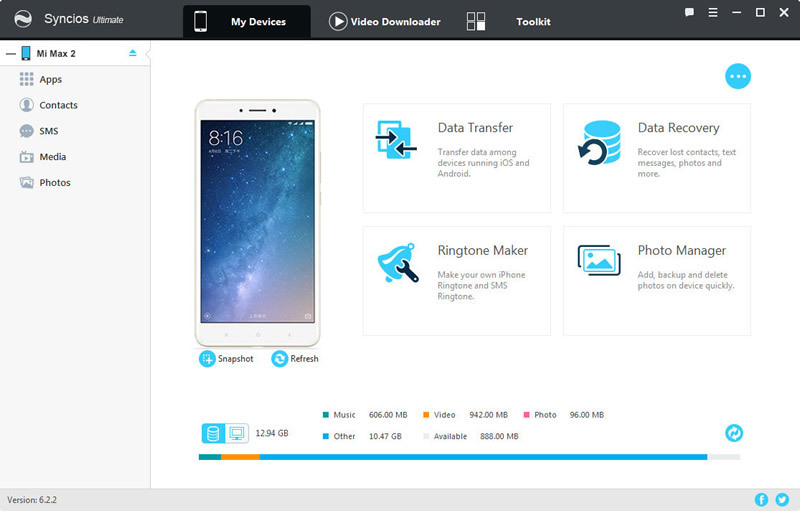 You can select the content to transfer once Syncios has finished to sync your phone. Click 'Next' and the transferring process will launch. Tips: Detection problem please click → Here. Mi Max 2 and your computer must access to the same network when using Wi-Fi to connect. Choose 'Restore' at the first interface and connect your Xiaomi Mi Max 2 to computer. All the backups are listed by the timeline on the left panel. You can select the backups you have made before. 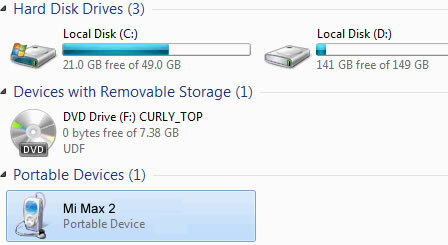 Choose the backups and click 'Next'. 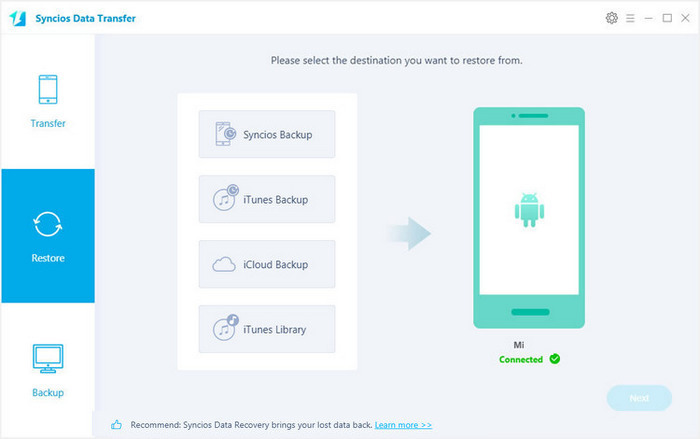 You can recover your data through iTunes backup file, iCloud backup file and iTunes library through Syncios Data Transfer. The recovering steps are the same as the former show. You can also use the most common way to transfer. Via your USB cable to PC and move the file by manual. Step 1. Connect Xiaomi Mi Max 2 to your computer via USB cable, and your computer will recognize it as a removable USB drive. Step 2. Drag down Notifications panel from the top of your Xiaomi Mi Max 2's screen, connect as "Media device(MTP)". Click 'ok' when the "Allow USB debugging" pop out. Step 3. Ensure Xiaomi Mi Max 2's drive installed succecefully on your computer. 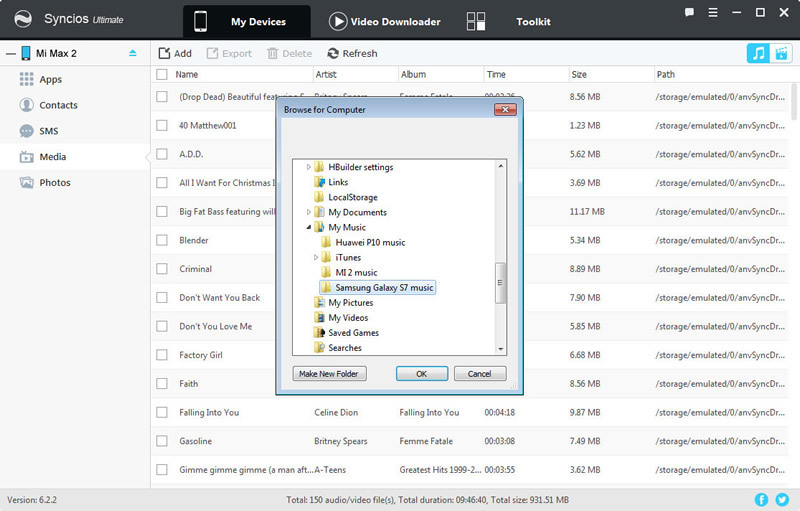 Find the music file that you want to import to. Step 4. Select and copy the music clips from computer to the folder on your Xiaomi Mi Max 2. Supported OS: Android 3.0 to Android 9.0.